In its second year, the Slam Dunk contest saw several changes to its structure, including the addition of local restaurants as team partners. Last year’s contest had four teams which were each assigned two barbecue meats to cook, with the final contest and awards presentation on the day of the Final Four. This year’s competition had two separate semi-final events prior to the Final Four game day, which divided the seven teams into two separate brackets to compete in. “We learned a lot last year, and as with any new tradition we hope to make it better this year and continue to improve the process over time. The decision to sponsor two semifinal nights was simply an effort to include more teams, more students, and more faculty members in the process,” Shackelford said. Before the first game between Florida and Connecticut began, Parker Oliver (C’89), executive director of Marketing & Communications, announced the winners of each barbecue category and presented the winning teams with their medals. Teams placed either in 1st, 2nd, or the People’s Choice For the chicken wings category, team Latin Sensation (Bachman) came in first, pulled pork saw team Manifeast Destiny (Register/Berebitsky) as the winner, and team Smokin’ Hot (Wilson won best beef brisket). Will Yum’s Monopolizing BBQ (Williams) won for pork ribs. Teams were also given awards for best McClurg station decorations. Most importantly, however, was the transformation of McClurg into an area where all could eat, drink, and enjoy themselves as both Final Four games played on a large screen projector at the back of McClurg’s “fratside.” “There was a great atmosphere, especially since it wasn’t just students; there were a lot of faculty members and families. “It was great everyone could come together to enjoy the game,” Bri Ehret (C’16) said. The teamwork and commitment required of planning and preparing 200 lbs of meat also served to form connections between the students, faculty, and community members. “Being able to interact with professors and the chefs was my favorite part. Especially outside of normal circumstances like the classroom,” Tanner Potts (C’15), a member of team Manifeast Destiny, said. “The real work was done by Dining Manager Wyatte Stuard, Chef Rick, owners of the local restaurants, and the faculty members who volunteered to coach a team. Nancy Berner, Doug Williams, Deb McGrath, Rob Bachman, John Grammer, Woody Register, Julie Berebitsky, Scott Wilson, and Virginia Craighill deserve all the credit for a successful event,” Shackelford said. 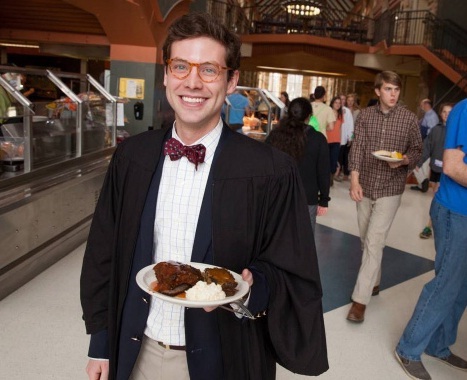 The fruits of their labor provided an excellent atmosphere for the community at large to enjoy, as well as excellent food in an event that is hopefully on its way to becoming a strong Sewanee tradition.